The products and services we offer our customers are all intended to provide increased performance and reduced issues; during drilling, tubular-running, and cementing operations. Our equipment is designed to get you to bottom faster, and easier. We have chosen our equipment very carefully, as our name depends on it. The brands we represent are field proven, quality engineered, and rigorously tested. These products are being used all over the World, for customers of all sizes – and in many varying applications. We strive to be a partner to our customers, not just a supplier. Whatever your goals; we want to get you there. Below is a very small sampling of some of our most popular products. Please click the links to Top-Co or Tercel, to see the full list of our offerings from those lines. If you need something else – just ask; we’ll find it. 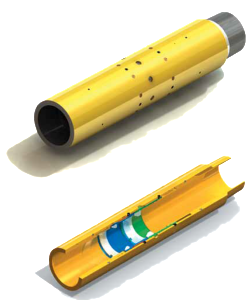 The NaviGATOR™ is a casing-based tool that ratchets and rotates the end of a casing or liner string by reciprocating the pipe. A casing reamer shoe or guide shoe with an eccentric profiled nose can be placed below the tool so that the relative rotational motion from reciprocation can be used to orientate the nose over or past obstructions. The tool, which can be used on cemented or un-cemented casing strings, completions, liners and sand control screens, is simple to install and improves the probability of casings, liners and other open hole deployed systems reaching planned TD. 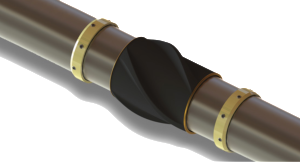 With the energy industry’s challenging and exacting performance requirements Top-Co’s 525 Float Collar and 526 Float Shoe have been designed to perform under the most severe downhole environments. Certified by Lloyd’s Register the Type 525 Collar & Type 526 Shoe meet API RP 10F Category IIIC specification. Manufactured from seamless casing grade steel (available in all grades), the float equipment features the open cage Top-Flo valve. TheTop-Flo valves combine a high flow area with temperature capabilities up to 400°F. 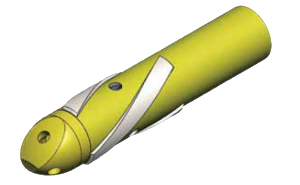 The open cage design of the Top-Flo is optimized to allow for circulation of LCM (lost circulation material) while keeping the overall length of the float equipment relatively short. The Top-Co Type 525/526 Float Collar & Shoe provide optimum performance under challenging conditions including; shallow wells, deep wells, extreme temperature and pressure ranges, sour gas and abrasive flow resistance. The 525/526 models are recommended for horizontal or deviated wells where low differential pressure may prevent sealing. The 525/526 system is a multi-purpose design that can be utilized in all applications from close tolerance liner to full casing string. • API 10F tested to a III-C rating: 24 hours @ 10 bpm flow test, 5000psi back pressure at 400°F. • The valve seal is a specially formulated oil resistant rubber for high temperature use with extreme wear resistance properties and is positioned for protection from potential fluid flow damage. 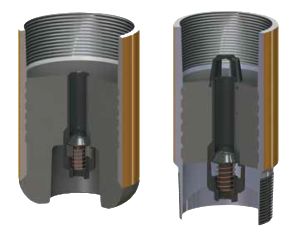 • Plunger design prevents plunger rotation and erosion due to fluid flow. • Valve throat protects the concrete from erosion. • While under fluid flow spring is protected by the poppet. Click here to visit Top-Co. The GunDRILL™ Reamer is a versatile drilling reamer. This unique PDC-based reamer is the only one of its type on the market today, delivering accurately gauged and high quality wellbores. This tool can open boreholes in cases of severe swelling and/or borehole instability. It provides reaming through a simple blade design that uses proprietary Tungsten Carbide Inserts (TCI) that give more reaming or stabilization according to the drilling and formation conditions and maintains the gauge for extended durations. TCI distribution is optimized to provide continuous reaming in longitudinal and radial directions. The Tercel PDC distribution works with our in-house cutter matrix design, resulting in balanced drilling and reduced vibrations. PDC gauge is passive, allowing it to interact with formation only when undergauge occurs. The GunDRILL is highly flexible being uni-directional for applications where only back reaming is required and bi-directional for applications where front and back reaming is required. There is also the directional variant with flat TCIs for applications where sliding is expected. The tool can be made in steel and non-magnetic configurations to extend the flexibility of tool placement anywhere along the BHA. Click here for a more complete listing of reamers available from Scepter Supply and Tercel Oilfield. 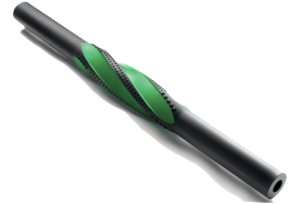 The MicroCORE™ Bit, developed in collaboration with TOTAL, is a revolutionary drill bit design that allows the continuous generation of micro-cores while drilling. The core, broken by the bit is carried to the surface up the annulus along with the drilled cuttings. 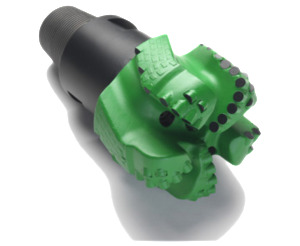 With operators looking to improve drilling efficiencies and geological insight through the analysis of larger formation samples, the MicroCORE Bit eliminates cutting in the central area where the cutting process efficiency is at its poorest. The generation of high quality undisturbed cuttings provides crucial geological information, giving operators the opportunity to analyze a continuous flow of valuable formation material while drilling faster. The result is significant drilling performance improvements with ROP increases of up to 35%* and the generation of micro-cores from 5 to 30mm providing decision critical information without the cost of an additional run. Click here for a more complete listing of bits available from Scepter Supply and Tercel Oilfield. Top-Co Type 340 Stand-Off Band can be used in deviated and vertical well applications, where wellbore fluid turbulent flow is required. • Vanes set at 17° for maximum turbulent flow. • Provides positive stand-off in both cased and open hole. • Angled fins provide increased fluid turbulence. • Cost effective and easy to install. • Recommended for use in close tolerance and liner applications. • Allows for reciprocation and rotation during cementing. • Available in common casing sizes. Recommended for installation between Type 415 Stop Collars or allowed to float on the casing. 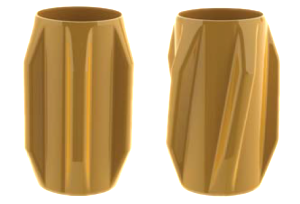 The EzeeGLIDER® is a highly durable, wear resistant engineered polymer centralizer that reduces torque and drag and does not bind or jam as other metal products do. The tool has demonstrated field proven lower friction coefficients, leading to superior drag and rotational torque reduction and no requirement to rotate the completion assembly at any point during the operation. 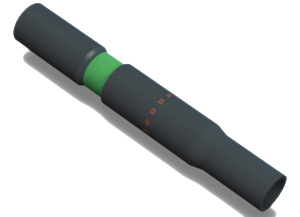 Customer benefits of the tool, made from a high temperature high-pressure injection-molded engineered polymer, include reduced torque and drag and enhanced deployment and removal capabilities in ERD, highly deviated and horizontal well bore. The EzeeGLIDER also extends well construction boundaries, increases the length of open hole completion to provide additional reservoir exposure/drainage and places forces where they are required instead of being lost in the form of drag. Click here for a more complete listing of TD Solutions available from Scepter Supply and Tercel Oilfield. The 346 Top-Reach Glider is a low drag centralizer used in highly inclined and horizontal wells. The Top-Reach Glider, a molded thermoset polymer centralizer with vane quantity and width dependent on pipe and open hole size. The vanes feature a shallow 20° chamfer on the tip to reduce friction and improve ease of running into the hole. The Type 346 Top-Reach Gilder was developed in response to challenges encountered in longer reach, highly inclined and horizontal wells. 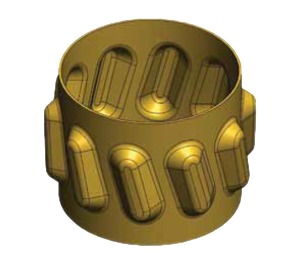 The Type 346 aids in effectively getting casing to bottom and achieving good zonal isolation. The Top-Reach Glider is designed for slip-on installation over the casing and can be used with compatible stop collar; Top-Co 416 Heavy Duty Slip-On Stop Collar. The Tercel NightHAWK Series Sealed Bearing Motor features the strongest driveline on the market today, allowing the operator to have a choice of any power section required to meet the drilling requirements. The sealed pack ensures minimal pressure is applied to the oil chamber by dumping excess volume through a flow restrictor system strategically located mid tool. This is paired with a floating piston and extra seal grooves to reduce the likelihood of mud invasion preventing costly damage to the motor. On and off bearings are custom made specifically to fit the Sealed Bearing Motor so maximum loads can be used while drilling, as well as robust radial bearings to build consistently without premature damage due to wear. Click here for a more complete listing of motors available from Scepter Supply and Tercel Oilfield. The 528 Side Winder Float Shoe is designed for problematic well conditions (such as bridging, swelling, or ledging) where reciprocation of the casing is required to ream the hole and land the casing or liner to depth. The eccentric nose climbs ledges and negotiates impediments while the helical vanes ream out difficult spots in the wellbore. Compatible with all casing and liner hanger assemblies, the system provides effective protection against casing and liner running problems, whether anticipated or not. • High Flow valve maximizing flow rate. • Casing side ports for optimized circulation preventing channeling during cementing process. • Eccentric nose with down jets to guide over ledges and overcome obstructions. • Helical blades manufactured from hardened 4140 Alloy steel or Tungsten Carbide cutting structure. • Tungsten Carbide cutting structure facilitates both rotating and reciprocating applications. • Helical stabilizer blades combined with cutting structure clear a path for casing or liner. • Double valve system available. • Nose options include aluminum spade and aluminum nose alternatives. • API and premium connections available.